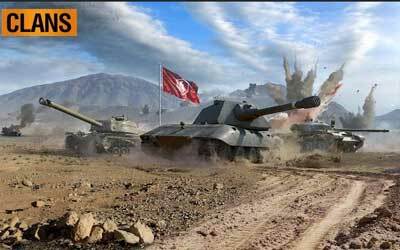 You can get this exciting experience of driving tanks by playing World of Tanks Blitz APK 3.0.0.376. This game provides more than 200 iconic types of tanks from World War II that you can drive into the front lines of the battle. Defeat your enemy by using your mighty tanks. The game that was developed by Wargaming World is categorized as action game in play store. You can download and install this free game right away to enjoy what tank driving feels like. When playing this game, you are invited into a warfare situation where you have to defeat your opponents by using your tanks. There are several biomes of battlefield in this game, such as tundra, savanna, or dessert. You can found four different types of tank. Besides the light tank, you can choose the medium tank, heavy tank, or destroyer tank. The graphic and animation of this game is decent. Moreover, you can see the stunning detail when you play the game. Besides the refined graphic, you can also enjoy the realistic sound effects of tank firing. It provides several features and game mode. This game allows you to play seven players versus seven players. There are three countries involved in the warfare. Each country produces different types of tanks that you can choose. A certain tank has its own benefit and detriment. For example, you can choose the mighty tank with heavy armor. However, the armor protecting that certain tank slows it down. Most reviewers also state that the mechanic of this game is realistic enough. When you shoot a tank, it is going to be damaged and not capable of doing counter attack. Those reviewers also wrote that the tank on this game is easy to control. You can play World of Tanks Blitz for Android by yourself to experience the excitement of being in the tank battlefield. Supremacy: new game mode with the objective of earning 1,000 victory points by capturing bases or destroying all enemy vehicles. Updated Falls Creek: features not only a reworked design, but also altered map gameplay. Increased profitability of Tier V-X vehicles, including the Maus, IS-4, FCM 50 t, etc.